Qiu Ying (style name Shifu, sobriquet Shizhou) resided in Suzhou. He studied painting under Zhou Chen (1460-1535) and came to excel at landscape and figural subjects, becoming known along with Shen Zhou, Wen Zhengming, and Tang Yin as one of the Four Ming Masters. This painting is done on two bolts of silk joined to make an oversized hanging scroll. It depicts a figure sitting on a rock as two people have boarded a boat on the other bank. Another person arrives carrying a shoulder load, the boatman raising his hand to beckon him make haste. The figures are all delicately rendered and spirited, the coloring beautiful but not too strong or dense. The brushwork for the mountains is done in outlines with chopping strokes similar to "axe-cut" texturing, and the composition of space forms a zigzag that extends into the distance to express the expansiveness of a water-filled realm. 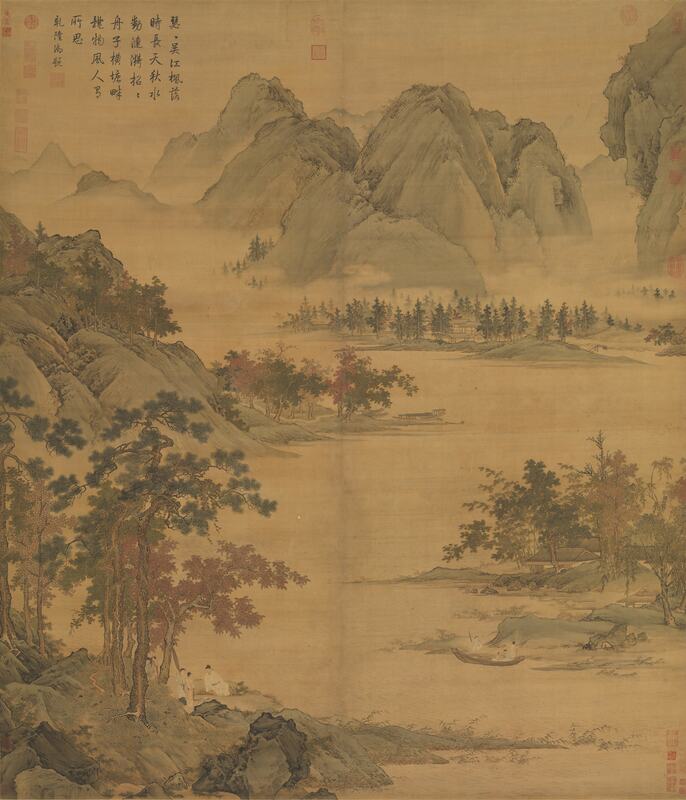 This harks back to the tradition of Zhou Chen, who studied the painting style of the Song dynasty, taking the dense landscape and transforming it into openness. Although this painting is undated, the artistic achievement is exceptional, suggesting a masterpiece from Qiu Ying's late years.